Thanks to the kind generosity of H.R. 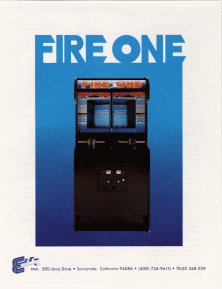 Kaufmann, president of Xidy, the original ROM images for Fire One have been made available for free, non-commercial use. Fire One! 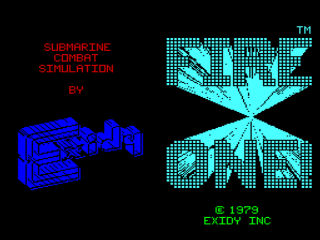 was a player-versus-player or player-versus-computer submarine showdown, designed and programmed by David Rolfe, Ted Michon, and Susan Ogg for Exidy in 1979. 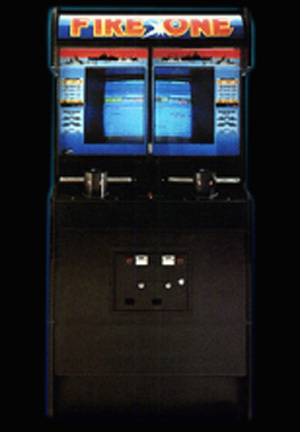 The cabinet was split into two halves, with each player controlling their first-person submarine perspective on their half of the screen. 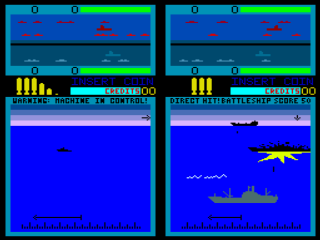 The primary objective of the game is to find and destroy the enemy's submarine, while avoiding the enemy's torpedoes. 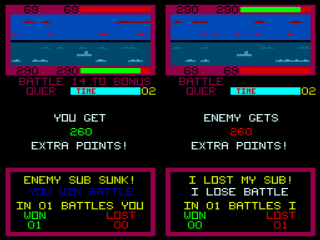 Through your virtual periscope you are free to launch one of your 8 torpedoes to take out any of the enemy's various ships for extra points. 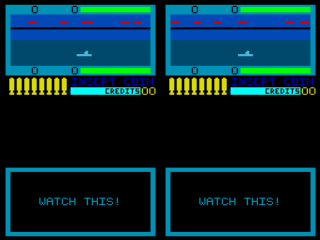 It takes some time to reload each torpedo tube, so you must be judicious in how you plan your attacks. 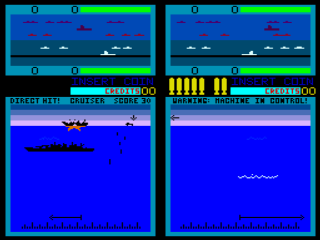 In addition to being able to control the left/right rotation of your periscope, the game also features a submerge button which you can use to temporarily hide from the enemy. Holding this button down keeps you hidden but also keeps you out of the action, allowing the enemy free reign over the seas.